Despite the efforts to cheer us up after witnessing the "Red Wedding," Game of Thrones fans are still pretty bummed. Well friends, here's a little treat that may just bring joy back into your lives during our hot-as-dragonfire summer because Ice Cream Is Coming! Social media gurus, Foursquare and Game of Thrones network, HBO, are pitting nine ice cream giants from San Francisco and NYC against each other for supreme reign over your tastebuds. In order to compete in the "Game of Cones," all you have to do is check in at your favorite spot in either city to advance their placement. Running from now until June 21st, the race is on. Aside from mass quantities of tasty frozen treats, this nompetition also promises one of the most coveted prizes in GoT fandom to the winning shop; the Iron Cone. 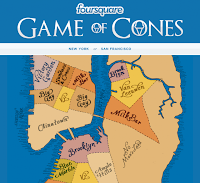 According to Foursquare's Game of Cones leaderboard, Big Gay Ice Cream of NYC is currently ruling the realms of flavor. Of course, Big Gay is also sweetening the deal by offering loyal subjects a special Game of Cones pins when they check in at the shop. If you're in either of the competing cities, pledge your house allegiance by checking in or tweeting, enjoy a scoop and you'll be rewarded with some killer exclusive deals.